With a natural creeping habit, Sedum ‘Bertram Anderson’ is useful as a ground cover plant. Attractive deep red pink flowers from mid to late summer into autumn make this a great addition to any dry garden. Bees love it when its in flower, and this is a very easy care low maintenance plant. This is one of the best creeping stonecrops, it will spread to cover a good area over time, we grow ours in a container, it is equally at home in a rock garden, or even in the general garden border. This is an evergreen to semi evergreen variety depending on the climate. In cooler areas it candy back in winter, however it reliably reshoots for us every year. Sedums are commonly called the stonecrops, they are found growing on poor stony ground, and Sedum ‘Bertram Anderson’ is one that copes well with these conditions. However it is in a container, allowed to flow over the sides that we think it shines. Best in full sun and in a well drained soil. Simply water when the growing medium drys out, fertilise a little once a year, and repot every 3 – 4 years. Over time it will form a clump and can easily be divided to propagate. It will perform a little better in a humus rich soil, as long as it is well drained. Generally very rich and fertilise soils are not suitable for Sedums as this tends to cause long or ‘leggy’ growth. Like many trailing plants, pruning is recommended to get the plant compact and bushy. Trim back lightly in early summer, and again just after flowering for good results. We first came across this particular sebum at a plant fair, attracted by the foliage we added it the collection. We have found that propagation is fairly easy. You can try normal softwood cuttings taken in early summer. Or you can easily divide established clumps in spring to early summer. Growth rate – Medium to fast depending on soil and climate. Foliage – Deep green to purple with a coppery tone. Flat oval leaves on a red stem. 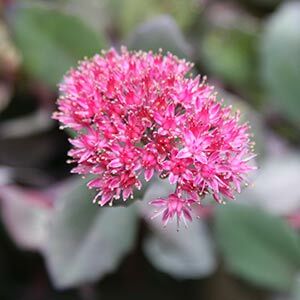 Container growing – Yes, Sedum ‘Bertram Anderson’ is well suited to container growing. Sedum ‘Bertram Anderson’ is available for sale from the following participating nurseries.